This document is intended as a reference and standard for honeybee management in Maine, with particular emphasis on urban/suburban locations. Honeybees not only produce honey but also play a vital role in the balance of nature, especially in pollination of agricultural crops, horticultural crops, and home gardens. Pollination is important for the viability of many farming enterprises, market gardens, orchards, and seed industries. Some important Maine food crops, including apples, raspberries, blueberries, and squashes, either depend on or benefit greatly from honeybee pollination. It has been estimated that work by honeybees contributes about $100 to $150 million annually to the Maine economy. In 1975 the honeybee was officially designated as Maine’s state insect in recognition of its importance to the Maine economy. Beekeeping is becoming increasingly popular in nonrural areas. Maine currently has just over 1,100 registered beekeepers who manage around 10,000 hives. Beekeeping provides honey for home consumption, enjoyment in watching these highly social creatures, and the opportunity to join an amateur bee- keeping group. However, honeybees possess a sting and therefore require proper and responsible management so they do not create a problem for neighbors. A compendium of best management practices that all Maine beekeepers should follow. It is a requirement under the Title 7 MSRA, section 2701 to become a registered beekeeper with the Maine Department of Agriculture if one or more hives are kept. Registration is valid for a twelve-month period expiring in mid-June. 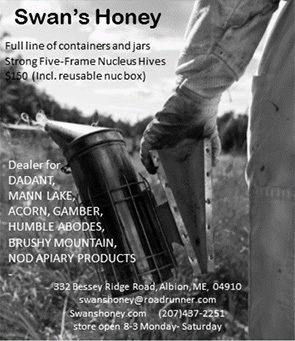 Registration forms can be downloaded from the Maine State Apiary Program website. Renewal forms are sent annually to previously registered beekeepers for return to the Maine Department of Agriculture, Division of Plant Industry along with the appropriate annual fee specified in the fee schedule. Beekeepers who change addresses are requested to notify the Department. The list of beekeepers who collect swarms is updated annually. Swarm inquiries from the public may be directed to the Maine Department of Agriculture, to County Extension Offices, or to the Maine State Beekeepers Association. Other general beekeeping questions may be directed to the Maine Department of Agriculture or the Maine State Beekeepers Association. Bees seeking water or food. Bees naturally forage flowers for nectar and pollen. In abnormal circumstances, when natural sources of food and water are scarce, bees may forage supplies of animal feed, water, or protein. A number of adult bees, with or without a queen, contained in a ventilated ship- ping cage transported via USPS or other carriers. Bees attempting to access honey stored or spilled in another hive. Taps, hoses, pools, hot tubs, streams, ponds, puddles, etc. Regardless of lot size: If all hives are situated at least 200 feet in any direction from all property lines of the lot on which the apiary is situated, no limit on the number of hives. Regardless of lot size: As long as all adjoining property that falls within a 200-foot radius of any hive is undeveloped property, no limit on the number of hives. Correct placement of hives is a most important consideration for responsible beekeeping in urban/suburban situations. Hives must be in a quiet area of the lot, not placed directly against a neighboring property unless a solid fence or impenetrable vegetative barrier not less than six feet high forms the property boundary. Keep hives as far away as possible from roads, sidewalks, and rights of way. Hive entrances should face in such a direction that bees fly across your property. If this is impos- sible, use barriers (hedges, shrubs, or fencing six to twelve feet high) to redirect the bees’ flight pattern. Swarming is a natural instinct of honeybees that occurs chiefly from spring to early summer. Swarming is a natural instinct of honeybees that occurs chiefly from spring to early summer. Swarms should be collected to prevent their becoming a nuisance. Honeybee colonies can and should be managed to prevent or minimize swarming. For example, brood chamber manipula- tion, colony division, adding supers for brood rearing and honey storage, and replacing old or failing queens can all reduce the swarming impulse. These and other management practices to control swarming are explained in detail in good beekeeping textbooks. Beekeepers who learn of a swarm should take reasonable measures to see that the swarm is retrieved. Beekeepers should provide water for their bees before locating them in their yard. Bees prefer a sunny place with surface moisture, for example wet sand or gravel or the edge of a birdbath. If you establish such water sources, your bees will become habituated to them and will be less likely to visit swimming pools or hot tubs. Remember that in very hot weather, bees use a large amount of water to maintain temperature and humidity within the hive. In any instance that a colony exhibits unusual defensive characteristics (stinging or attempting to sting without provocation) or exhibits a frequent tendency to swarm, it is the beekeeper’s duty to requeen from European stock. When nectar is scarce, honeybees may rob honey from other hives. Under such conditions, bee- keepers should work hives for only a very short time, if at all. Exposing honey (especially sticky honeycombs) outdoors often encourages robbing. All spilled honey should be cleaned up immediately. To prevent robbing, buildings and trailers used for honey extraction must be made beeproof, as far as is practicable. There are a number of honeybee diseases and pests, of which American Foulbrood (AFB) is the most serious. Beekeepers should be extremely cautious about mixing hive equipment or purchas- ing hives from sources that are not certain to be AFB-free. (Contact the Maine Department of Agriculture to have used beekeeping equipment inspected.) Finally, it is incumbent on beekeepers to manage parasitic mites and other pests responsibly for both colony health and honey quality. Beekeepers must take appropriate care when transporting hives of honeybees. All loads of hives and supers of honey must be secured in accordance with Maine Department of Transportation regulations. Bees being transported should have entrance screens or be secured under netting. The Maine State Beekeepers Association gratefully acknowledges our debt to the Code of Practice for Urban Beekeeping in Queensland (http://www2.dpi.qld.gov.au/bees/16815.html), published by the Department of Primary Industries and Fisheries, Queensland, Australia (www.dpi.qld.gov.au), and to the Model Beekeeping Ordinance for Louisiana Local and Municipal Governments, published by the Louisiana State University Agricultural Center. Information is provided in this document as general advice on sound beekeeping practices. Beekeepers, local authorities, and others should seek professional advice on specific issues and situations. © 2007, Maine State Beekeepers Association, Inc.